Transitioning to a clean energy takes everyone – millions of small actions and dozens of large actions. 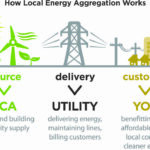 Community Choice Aggregation (CCA), similarly known as Clean Choice Energy (CCE) projects are one of these large actions. 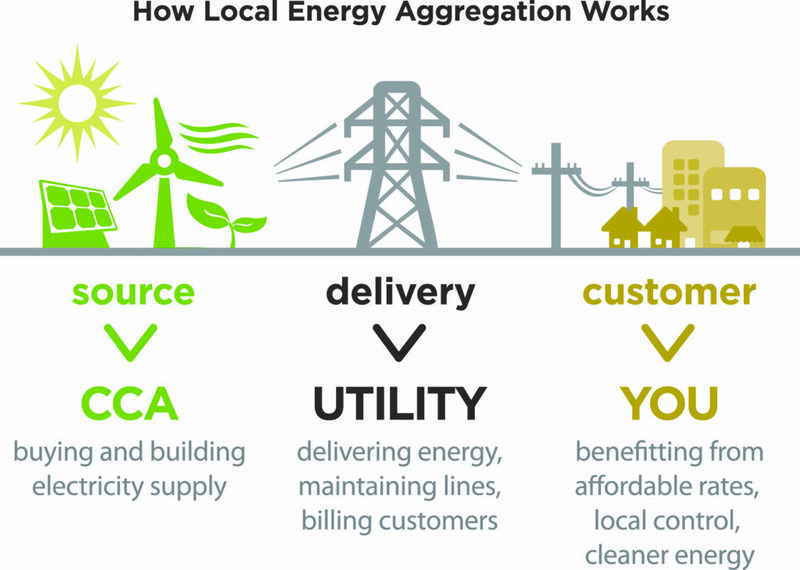 CCA’s allow local governments to procure power for their residents and businesses directly from power providers, not through utilities. The overall aims of CCAs are to provide a greater percentage of clean energy as well as reduced prices for customers. Currently, CCAs are allowable in Massachusetts, Ohio, Illinois, New Jersey, New York, Rhode Island and California. 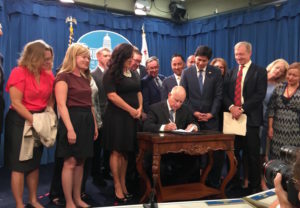 CCAs are a strong player in California’s aim to procure 100% clean energy by 2045, as set forth in Senate Bill 100. There are many CCAs in existence from Humboldt County to Ventura County, with plans for several more, including ones in San Diego and Clean Power Alliance in Los Angeles/Ventura County. For more information, go to Clean Power Exchange and CalCCA. CIPL has been a strong supporter of CCAs for years, advocating for supportive legislation, opposing restrictive legislation and offering public comment with the CA Public Utilities Commission. At present, CIPL is excited to be involved two CCAs – Peninsula Clean Energy and Silicon Valley Clean Energy for a solar+storage resiliency program and CCA outreach, respectively. Check out a CCA in your area and get involved in outreach or help set up a new one! GL Hodge receives an award for his work at the San Francisco Interfaith Council celebration of Dr. Martin Luther King, Jr.
On Monday, January 16, the San Francisco Interfaith Council, one of CIPL’s partners, held a Dr. Martin Luther King, Jr. event entitled “The Urgency of Now.” This phrase refers to Dr. King’s popular and ever-timely phrase, We are now faced with the fact that tomorrow is today. We are confronted with the fierce urgency of now. In this unfolding conundrum of life and history, there “is” such a thing as being too late. This is not a time for apathy or complacency. This is a time for vigorous and positive action. At this event, several prominent people were recognized for their leadership in pressing justice issues. One was GL Hodge, a CIPL Steering Committee member, who has been a force for youth and the faith community, especially from the Bayview Hunters Area of San Francisco. 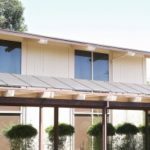 GL, in addition to his many efforts on climate and community protection, spear-headed the energy-efficiency and solar energy upgrade for Providence Baptist Church in San Francisco. A coalition of folks from the faith, public health, equity, labor, policy and environmental sectors demanded that the EPA keep the Clean Power Plan in place. 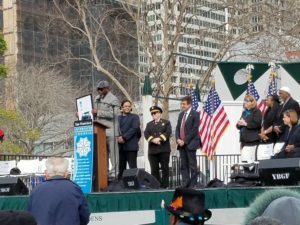 On February 28, the federal Environmental Protection Agency held one of three listening sessions in San Francisco, ahead of its plan to repeal the Clean Power Plan, a program that, over the last five years, has received wide support from multiple sectors including tireless advocacy from the faith community. 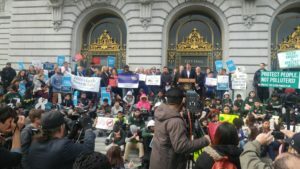 The majority of folks at the San Francisco session overwhelmingly demanded the Clean Power Plan be kept in place, in light of the fact that it will save tens of thousands of lives, prevent countless incidents of respiratory and cardiac illnesses, and create jobs, all while decreasing the U.S.’s pollution output by one third by 2030. 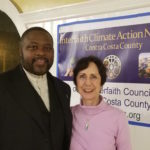 February 28 also witnessed a multitude of organizations from the faith, equity, public health, policy and environmental sectors coming together for the Green California Symposium in Sacramento. Excellent networking and preparations for 2018 were the order of the day, including: pressing 2018 legislation and ballot propositions; “best practices” for advocacy; and methods for continuing the transition to clean energy. On March 4 in Claremont, CIPL Steering Committee member Mohammad Hoda was a presenter in a workshop entitled “Eco-Justice: Equity and Wellbeing in an Ecological Age.” Mohammad, who advises the Islamic Shura Council of Southern California on environment issues, and who lends his energy-efficiency expertise to Southland mosques, serves on the board of an upcoming international Muslim climate change mitigation effort called the Global Muslim Climate Network (GMCN.) 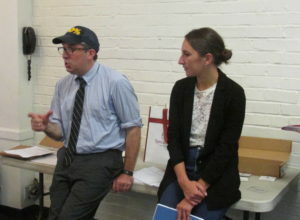 The workshop in Claremont was one of a long series of events involving Dr. John Cobb, a noted theologian, and inspiration for several sustainability groups implementing real-life strategies to reduce pollution and build resilient communities. On Wednesday, March 7, CIPL staff and intern, Allis Druffel and Emmanuel Nunez attended their first Watts Clean Air and Energy Task Force, held at St. John’s United Methodist Church in Watts. They were greeted warmly and given time to talk about the work of CIPL and the Low-Income Weatherization Program. In this meeting, Pastor Larry Dozier outlined his vision for St. John’s: to be an oasis in the desert, providing resources for the Watts community, and to be a beacon of light in terms of sustainability. Plans include energy efficiency upgrades, solar energy, and charging stations. St. John’s has already hosted an EV Ride ‘n’ Drive and undergone LADWP’s Direct Install program, with plans for an Earth Day celebration on Saturday, April 21 and another EV Ride ‘n’ Drive during National Drive Electric Week. 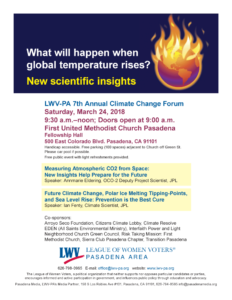 Two scientists from JPL presented an overview of the latest science of global temperature rise in Pasadena. On March 24, CIPL was a co-sponsor of the “7th Annual Climate Change Forum: What will happen when global temperature rises?” Held at CIPL member congregation First United Methodist Church in Pasadena, the event featured two climate scientists from the Jet Propulsion Laboratory, bringing their views on the latest science from the oceanography and ice/glacier fields. One topic of conversation was the Orbiting Carbon Observatory (OCO-2), launched into space in 2014, which measures hot spots of carbon dioxide around the globe as well as collecting other important data. OCO-3 is being built now and expected to launch in the next two years. Throughout the first quarter, CIPL intern Emmanuel Nunez continued his work on the Low-Income Weatherization Project. This campaign, funded by auction proceeds, offers regionally- and income-qualified households an array of free energy- and water-efficiency upgrades. The house may be rented or owned and must be a stand-alone dwelling or part of a duplex or four-plex. It is an excellent way for residents to reduce energy and water and save money, all while protecting Creation. While this program is state-wide, CIPL is an outreach partner in the Los Angeles County area. If you live in the Los Angeles area, click here to see if you qualify. We have updated portions of our website and have included a tab for Videos and Celebrations. 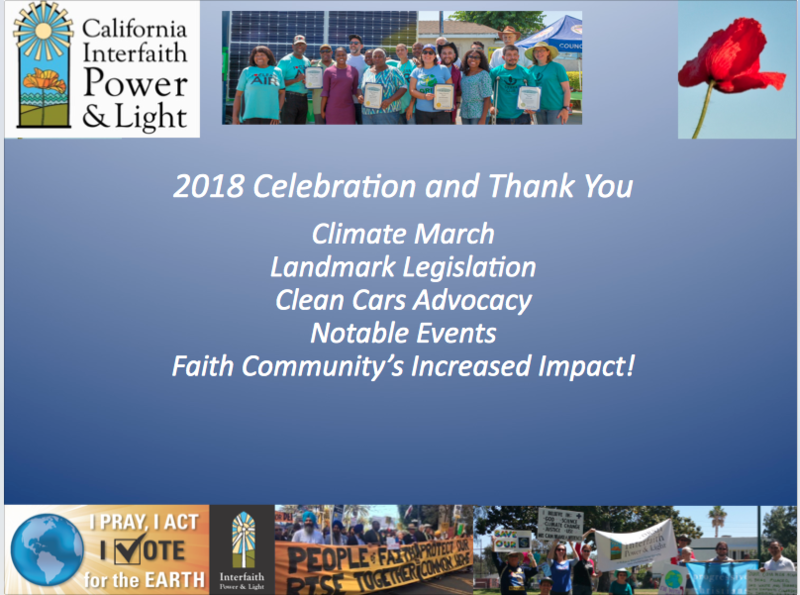 Check out inspiring videos of CIPL member congregations in action, feel free to share them with others, and please let us know of your efforts to protect all of Creation. We welcome our new members. Drop them a line and share the eco-love! Sacramento Lobby Day, June 26, 2018! Contact info@interfaithpower.org to participate or for more info. The faith community and its organizational allies are planning events that will help you implement your commitment to Creation. Check out our upcoming events here.